A custom kitchen doesn’t have to mean large and elaborate. This small space used our custom capabilities to maximize usable space. Alder wood with autumn blush finish. Here is a sample of our work in a home in Bucks County, Pennsylvania, outside of Philadelphia. Maple wood with paint and glazed finish. See our contractor’s section for an exterior view of this home. We have carefully and thoughtfully designed our cabinet doors and millwork to suit just about any design style. Samples can be ordered for any style in any finish. Call for more info. As with our door fronts, our drawer front options are just about endless. 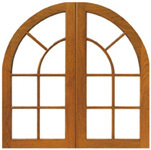 Choose from a variety of edge, framing and panel profiles. You want the focal point in your room to really stand out. Well, there is no better solution than to accent your cabinetry with some specialty doors.